The passages beneath Dragon Keep are the most dangerous territory in the Realm. Only the greatest burglars can sneak in, steal from the dragon, and escape to tell the tale. So naturally, you and your fellow thieves have challenged each other to do just that. 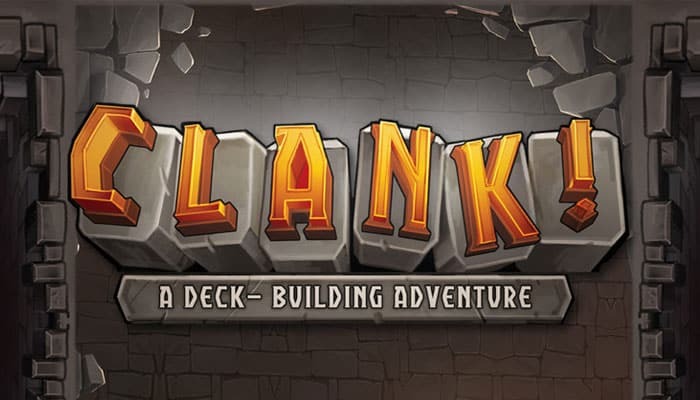 A Each player takes 30 Clank! cubes and places them in a personal supply in front of them. B Place the seven Artifacts (valued from 5 to 30) face up on the spaces marked with the corresponding numbers. If playing with fewer than 4 players, before placing the Artifacts, shuffle them face down and select some at random to exclude from the game. With 3 players, return one Artifact to the box. With 2 players, return two Artifacts. C Shuffle the Major Secrets face down, then place one at random on each Major Secret space. There will be extra Major Secrets. Return them to the box unseen. D Shuffle the Minor Secrets face down, then place two at random on each Minor Secret space. F Place the three Monkey Idols on the Monkey Shrine room. G Place the Mastery tokens near the top left corner of the board, one for each player. H Place the Gold tokens (valued 1 and 5) in a Bank next to the game board. I Place the Dragon marker (black) on the Rage Track. In a 4-player game, place it on the first space. In a 3-player game, place it on the second space. In a 2-player game, place it on the third space. J Place the 24 dragon cubes (black) in the Dragon Bag, and set the bag next to the game board. K Place the Goblin monster card in Reserve, next to the game board, along with the piles of Mercenary, Explore, and Secret Tome cards. L Shuffle the Dungeon Deck and deal six cards to form the Dungeon Row, face up on the table. 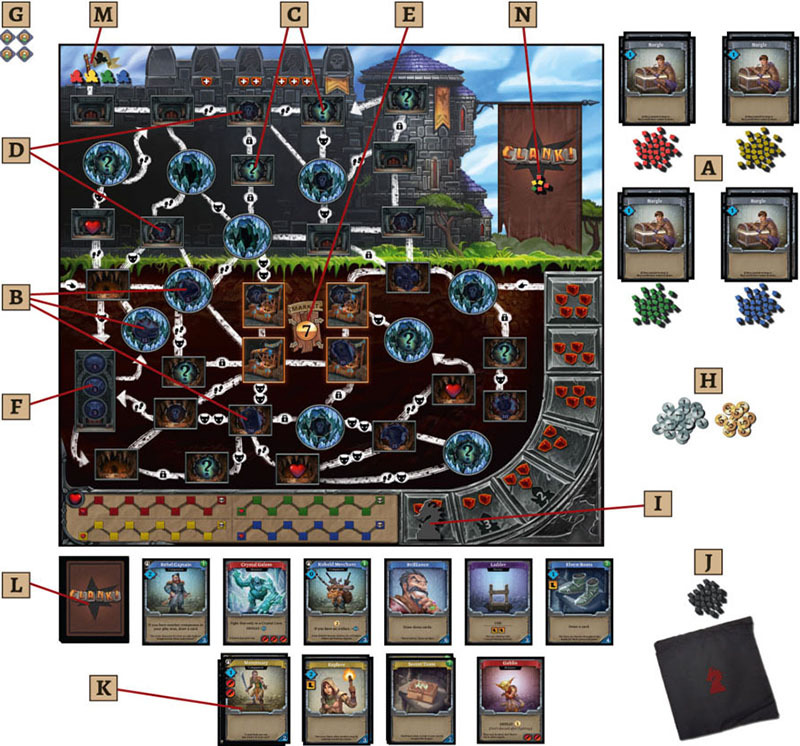 If any of those cards have the Dragon Attack symbol along the right edge, replace them with other cards until none of them show the symbol, then shuffle any replaced cards back into the Dungeon Deck. Leave room next to the Dungeon Deck to form a Dungeon discard pile during the game. M Each player places their pawn just outside the dungeon, at the top of the game board, then shuffles their 10-card deck and draws five cards from it. N The sneakiest player gets to go first (or you may choose randomly). Play will proceed clockwise from there. The first player places 3 Clank! cubes in the Clank! Area. The second player places 2 Clank! The third and fourth players (if there are any) place 1 Clank! and 0 Clank!, respectively. Skill is used to acquire new cards for your deck. Swords are used to fight the monsters that infest the dungeon. Boots which are used to move around the board. Every time you acquire a new card, you put it face up in your discard pile. Whenever you need to draw a card and find your deck empty, you shuffle your discard pile and turn it face down to form a new deck. With each shuffle, your newest cards become part of a bigger and better deck! Each player starts with the same cards in their deck, but they'll acquire different cards during their turns. Because cards can do many different things, each player's deck (and strategy) will become more and more different as the game unfolds. The terms of this thieving challenge are clear: everyone must go into the dungeon and steal an Artifact. Escaping with your life is technically optional, although vastly preferable. You can normally carry only one Artifact, and once you've picked one up, you're stuck with it. Choose carefully! Artifact isn't worth many points, but at least it's easy to get to. Make sure to gather more loot to keep pace with your rivals! Artifact is worth a lot more points, but the path to it is long and dangerous. Make sure you can escape the dungeon once you have it! Stealing from the dragon is far from a simple job. You'll have to navigate through the ruins, deal with monsters, and acquire valuable treasures. During your turn, you can use the resources you've generated-Skill, Swords, and Boots-to take any of the following actions. You may take each action as many times as you like, as long as you have the resources to do so. You can wait and take your actions after you've played all of your cards, or you can take actions between cards if you wish. Acquire A New Card For Your Deck. You can use Skill to acquire cards with blue banners from the Dungeon Row (which change throughout the game) or cards with yellow banners from the Reserve (which are the same in every game). The Skill Cost of a card is found in its lower right corner. Once you pay the cost, place the card in your discard pile; it is now part of your deck. Devices are the cards with purple banners in the Dungeon Row. Devices can be acquired with Skill, but they do not become part of your deck. Instead, you perform the USE text listed on the card and then place it in the Dungeon discard pile (next to the Dungeon Deck). The Skill Cost of a Device is found in its lower right corner. Monsters are the cards with red banners in the Dungeon Row. Instead of acquiring monsters with Skill, you fight them using Swords. The Swords required to defeat a monster are found in its lower right corner. When you fight a monster in the Dungeon Row, you gain the reward listed in its DEFEAT text. Then the card is placed in the Dungeon discard pile (not your own discard pile). You may also fight the Goblin in the Reserve. It is not discarded when defeated; each player may fight it multiple times each turn, earning its reward each time. The Market is a series of spaces where merchants serve those exploring the dungeon. If you are in a Market room, you may make a purchase. All items at the Market cost 7 Gold. Place each item you buy in front of you, in your play area. Items available at the Market are described on the back of this rule book. Boots are how you traverse the passages of the dungeon. Each Boot lets you move along one tunnel to a new room. A tunnel with Footprint icons requires two Boots to traverse instead of one. A tunnel with Monster icons deals that much damage to you when you move through it. For each Sword you use, you take one less damage (but you don't have to use Swords to move through a Monster tunnel). You cannot use a tunnel with a lock icon unless you have a Master Key token (purchased from the Market) in your possession. A tunnel shaped like an arrow can only be used in the direction of the arrow-you normally can't move through it in the opposite direction. When you move into a room, you can take one of the tokens there (Minor Secret, Major Secret, Monkey Idol, or Artifact) and put it in front of you. When you take an Artifact token, move the Dragon marker up one space along the Rage Track. You can only take one token when you move into a room. (If the room has more than one token in it, you must exit and re-enter to pick up another). You can't take an Artifact token if you already have one. You don't have to take a token if you don't want to. (You might want to pass up one Artifact to go after a more valuable one elsewhere). When you take a Minor or Major Secret token, reveal it. Whenever you enter a Crystal Cave room, you become exhausted while wandering its maze-like passages and cannot use any more Boots this turn. You may still be able to move by Teleporting (described in Advanced Maneuvers), but you won't be able to use Boots until your next turn. When you gain Gold, take it from the Bank and put it in front of you. Each Gold is worth 1 point when the game ends, but you can also use it for other reasons during the game, such as buying items from the Market. Some cards cause you to gain Clank! When this happens, add that many cubes from your personal supply to the Clank! Area of the game board. Some very sneaky cards cause you to remove Clank! For each negative Clank! you get, remove one of your Clank! from the Clank! Area. If you don't have enough Clank! there, you can instead avoid adding Clank! later in the turn if an effect would make you do so. Any leftover negative Clank! is lost when your turn ends. Once you've played all of your cards and used as much of your resources as you want to, your turn ends. Put all of the cards you played into your discard pile and draw five new cards in preparation for your next turn. Any Skill, Swords, or Boots you don't use are wasted, so make them count! The green player carries out the text on her cards as soon as she plays them, adding 1 Clank! to the Clank! Area for her Stumble, and then removing it when she plays Move Silently. (She has another -1 Clank! left over from Move Silently, which she could use later in the turn if she were to make more Clank!) She has a total of two Boots, which she uses to move through two different tunnels. She ends up in a Crystal Cave room; she could not have moved farther this turn, even if she had more Boots. She uses her two Swords to Fight an Orc Grunt in the Dungeon Row. She gains 3 Gold ( from the Orc Grunt's Defeat text), and places the monster in the Dungeon discard pile. She uses her total 3 Skill to acquire a Kobold Merchant from the Dungeon Row, placing the card in her own discard pile. (She has just acquired the card; she won't get gold or skill from it until she reshuffles her discard pile, draws the card, and plays it). Having played all cards in her hand and used all the resources she can, the green player ends her turn. The queen of Dragon Keep is Nictotraxian-but we just call her "Nicki". She's not going to like us sneaking around her lair and taking her things. At the end of every turn, if any of the six spaces for cards in the Dungeon Row are empty, refill them with new cards from the Dungeon Deck. If any of the cards drawn have a Dragon Attack symbol, the dragon attacks! (But only once, no matter how many Dragon Attack symbols were revealed). To execute an attack, take all of the Clank! in the Clank! Area and put it in the Dragon Bag. Shake it up and draw a number of cubes from the bag equal to the number shown in the Dragon marker's current space of the Rage Track. Each black cube drawn is set aside, but each colored cube represents damage dealt to that player. (Undrawn cubes remain in the bag-they might still be drawn out later). 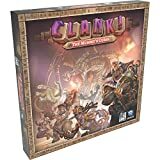 The more Clank! you make, the more likely the dragon is to notice and attack you. Managing your noise level is key to survival! The dragon's rage increases throughout the game. Every time an Artifact is picked up, and whenever a Dragon Egg (a type of Minor Secret) is discovered, advance the Dragon marker one space along the Rage Track. This may cause more cubes to be drawn in the next attack. The more cubes being drawn, the deadlier the game becomes. Tread carefully! At the end of the yellow player's turn, there are only three cards left in the Dungeon Row. Three cards are revealed from the top of the Dungeon Deck to fill the empty spaces. Two of them have the Dragon Attack symbol, triggering an attack this turn. All the cubes in the Clank! Area are placed in the Dragon Bag. The Dragon marker is currently on the fifth space of the Rage Track, so four cubes are drawn from the bag. One cube is black; it is set aside, affecting no one. The second is green, so the green player takes 1 damage. The last two cubes are both yellow, so the yellow player takes 2 damage. Dungeon delving is not without its risks. A master thief must carefully manage their physical state to maximize both profit and survivability. Remember, the two greatest obstacles to spending money are being broke and being dead. 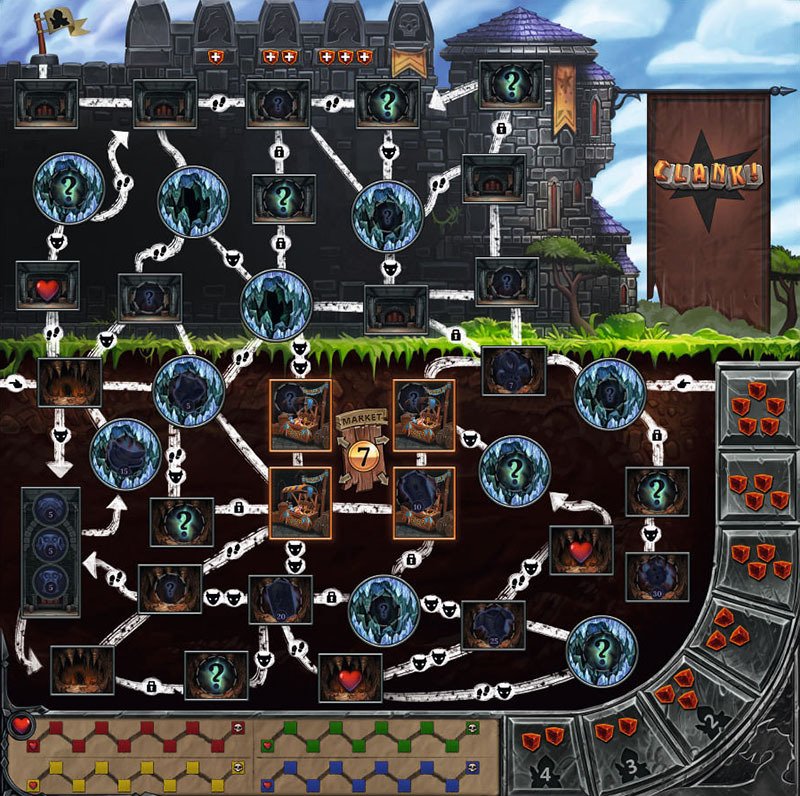 Each player's health is tracked on a Health Meter at the bottom of the game board. When you take damage during the game-and you will take damage-place your cubes on the Health Meter of your color, starting from the left. If the damage came from a dragon attack, use the cubes that were pulled from the Dragon Bag. If you chose to take damage by moving through a Monster tunnel without a Sword, take the cubes from your personal supply. You can't choose to take damage this way if it would completely fill your Health Meter! Some effects can heal damage you've taken. When you heal, take back a cube of your color from your Health Meter and put it in your personal supply. You can use it again later for more Clank! If your Health Meter is ever completely filled, you are knocked out. If you have retrieved an Artifact and escaped the Depths area of the dungeon, you are rescued by the townsfolk and can count the points you've earned. If you haven't gotten an Artifact yet, or if you are still stuck in the Depths, then you can't be rescued. You lose the competition, which at this point is the least of your worries. Once you've picked up an Artifact, you can also make your way back to the place you started, outside of the dungeon. If you make it all the way back before being knocked out, you will receive a Mastery token worth an additional 20 points! Remember, if you don't have an Artifact yet, you can't leave the dungeon, or even be rescued! Good timing is crucial in this heist-getting caught by a dragon is far worse than being pinched by the authorities! But as in all heists, there's nothing wrong with throwing your rivals under the proverbial carriage once you've made your escape. Whenever a player leaves the dungeon or is knocked out, they no longer take normal turns. They add no more Clank! to the Clank! Area. Cards that affect all players don't affect them. If any cubes of their color are drawn from the Dragon Bag, no damage is dealt-they are treated like black cubes. In addition, the first time any player leaves the dungeon or is knocked out, that player moves their pawn to the first (leftmost) space of the Countdown Track near the entrance to the dungeon. On that player's next turn, instead of taking a normal turn, they move their pawn forward one space on the Countdown Track and execute that space's effects. (Other players who later leave the dungeon or get knocked out do not use the Countdown Track). On the second through fourth spaces, this causes an instant Dragon Attack. Additional cubes are drawn from the Dragon Bag for each of these attacks: 1 extra for the second space, 2 extra for the third, and 3 extra for the fourth. On the fifth space, the dragon instantly knocks out all players still in the dungeon. The value of their Artifact. Points from any other tokens they acquired. Points equal to the amount of Gold they accumulated. Points awarded by cards in their deck. (The top right corner of each card shows the amount it's worth). The player with the most points is the winner and is declared the Greatest Thief in the Realm! In the case of a tie, the tied player with the most valuable Artifact is the winner.